My working hypothesis is that CA have been outed in revenge for TRump's firing of Feebie McCabe and his attack on the FBI as an institution. This theory could easily change and evolve as it's early days, but there's no way this story would've been allowed to break imo, unless there were powerful sponsors pushing it. Ergo, the US deep state. This the Beeb so you gotta wonder as David has about CA being outed. How come nobody sends beautiful Ukrainian women in my direction? Damn! CA is a very spooky company that has been doing spooky things for a lot of strange clients longer than most think...its now just starting to come out now. Do Americans have the slightest idea of the extent to which they are manipulated? That seems to be the big — and so far unexplored — question as scandal continues to explode around Facebook and a UK-based data company. The news is dominated currently by Cambridge Analytica, the data company that helped propel Donald Trump into the White House. It is in hot water this week, following reports that it harvested information from 50 million Facebook users without their consent. New stunning stories keep coming from the UK’s Channel 4. On Tuesday, these revelations resulted in the suspension of the company’s chief executive Alexander Nix. Previously, we learned that top Cambridge Analytica officials, including Nix, were caught on hidden cameras discussing dirty and possibly illegal campaign tricks — such as using beautiful women or fake businessmen to entrap rival candidates. The secretly recorded videos, which you can see below, pull back the curtain on modern political campaigns. More than anything, however, they show that the spread of social media, and the resulting reams of data that users willingly hand to companies like Facebook, allow campaigns to manipulate people into voting a certain way. If you’re collecting data on people and you’re profiling them, that gives you more insight that you can use to know how to segment the population, to give them messaging about issues that they care about, and language, and imagery that they’re likely to engage with. And we use that in America, and we use that in Africa. That’s what we do as a company. The two fundamental human drivers when it comes to taking information onboard effectively are hopes and fears, and many of those are unspoken and even unconscious. You didn’t know that was a fear until you saw something that just evoked that reaction from you. And our job is to get, is to drop the bucket further down the well than anybody else, to understand what are those really deep-seated underlying fears, concerns. It’s no good fighting an election campaign on the facts, because actually it’s all about emotion. [Second exec speaking:] I’m a master of disguise [laughter]. They will offer a large amount of money, to the candidate, to finance his campaign in exchange for land, for instance. We’ll have the whole thing recorded on cameras. We’ll blank out the face of our guy, and then post it on the internet. Send some girls around to the candidates house. We have lots of history of things. We’ve just used a different organization to run a very, very successful project in an Eastern European country where they did a really… no-one even knew they were there. They just drift, they were just ghosted in, did the work, ghosted out and produced, really, really good material. So we have experience in doing this. We subcontract to them. We use some British companies, we use some Israeli companies. Very effective in intelligence gathering. The British government had three contracts in the past with Cambridge Analytica’s parent company SCL Group but they ended well before the current issues, a spokesman for Prime Minister Theresa May said on Wednesday. [SIZE=1]Martin Luther King - "Injustice anywhere is a threat to justice everywhere." Albert Camus - "The only way to deal with an unfree world is to become so absolutely free that your very existence is an act of rebellion". Douglas MacArthur — "Whoever said the pen is mightier than the sword obviously never encountered automatic weapons." 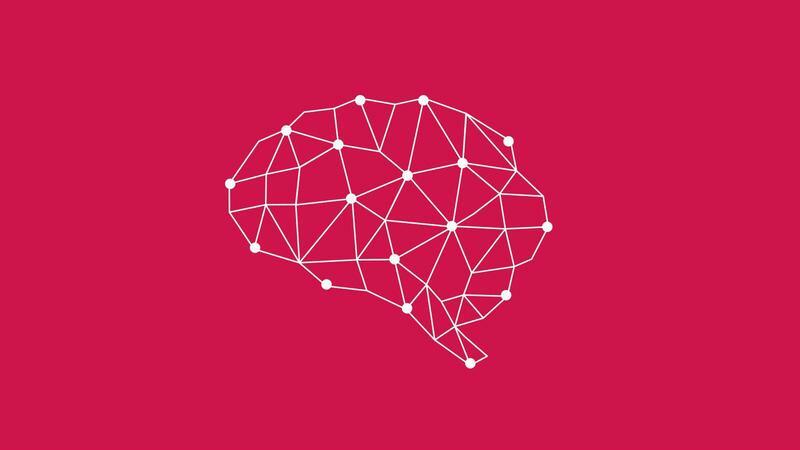 The case of Cambridge Analytica brings into focus a brave new world of electoral politics in an algorithmic age–an era in which social media companies like Facebook and Twitter make money by selling ads, but also by selling users’ data outright to third parties. Relatively few countries have laws that prevent such practices–and it turns out that the US does not have a comprehensive federal statute protecting individuals’ data privacy. This story is significant not only because it demonstrates what can happen when an unorthodox company takes advantage of a lax regulatory environment, but also because it reveals how Internet companies like Facebook have played fast and loose with the personal data of literally billions of users. The capacity for saturating global voters with charged political messages is growing across much of the world, since the cost of buying Facebook ads, Twitterbots and trolls, bots for Whatsapp and other apps is cheap–and since more people than ever are spending time on social media. Such systems can be managed efficiently by remote control. Unlike the CIA’s psyops efforts in the mid-20th century, which required extensive on-the-ground efforts–dropping leaflets from airplanes, bribing local journalists, broadcasting propaganda on megaphones mounted on cars–the new techniques can be deployed from a distance, with minimal cost. 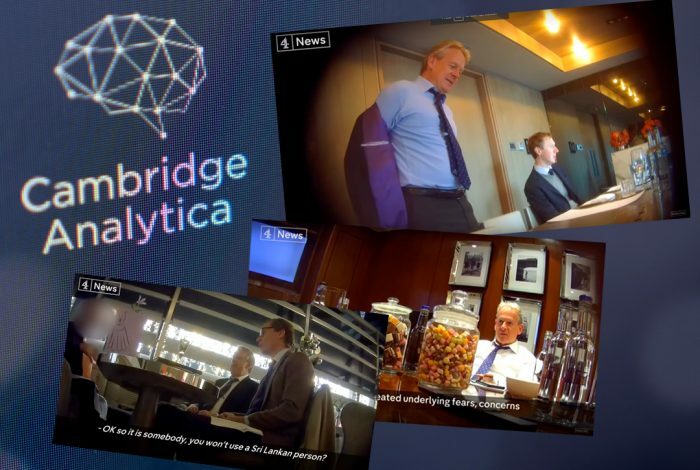 Cambridge Analytica relies upon small ground teams to do business with political parties, and partnerships with local business intelligence firms to scope out the competition or provide marketing advice, but most of the work is done from London and New York. The British government lies again. Something to hide. Lying and deception has become such a way of life in government/political and these times that I suspect speaking the truth is now regarded as an aberration. 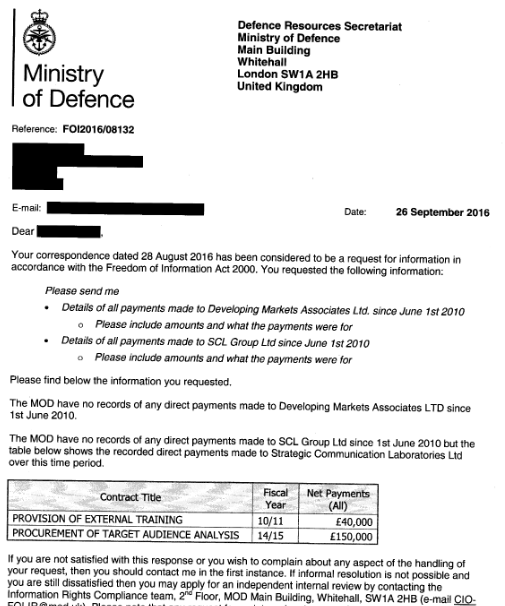 In the second of our explosive expose of the SCL Group we ask: what is the phantom contract with the MOD from 2010/11 and what did the ‘external training’ a previous FOI revealed involve? The MOD is now contradicting previous information it has given out under Freedom of Information laws. As a senior SCL executive admits to us that the company’s future is in doubt, Liam O’Hare argues that the government has critical questions to answer. Theresa May was yesterday forced into addressing the issue of links between the UK Government, the Conservative Party and a company at the centre of a scandal over data harvesting and dirty tricks. However, instead of clearing up the issue – the response has raised urgent questions about the nature of SCL Group’s (formerly Strategic Communications Laboratories) relationship to the highest echelons of state power in Britain. SCL Group is the parent company of Cambridge Analytica. They share directors and practise and are for all intents and purposes part of the same organisation. Between them they claim to have influenced more than 200 elections across the world. In an article for this website, I revealed the extent of the links between SCL Group and the British establishment – in particular the Conservative Party. Directors include an array of Etonian educated Tory donors, former government ministers, and high-ranking officers in the British army. These revelations led to the SNP’s Westminster leader Ian Blackford questioning May about these links at Prime Minister’s Questions yesterday. Her response sidestepped the issue of connections between her own party and the organisation and emphasised that the government has no “current contracts” with SCL Group. A Downing Street spokesperson later clarified that the government previously had three contracts with SCL Group. One was with the Ministry of Defence between 2014-2015, one with the Home Office in 2009 and one with the Foreign Office in 2008-2009. Here lies a glaring inconsistency. Last year, the MOD responded to a freedom of information request on its links with SCL Group. In its response it detailed TWO contracts it had with the firm. One of these was in 2014-15, worth £150,000 and involving the “procurement of targeted audience analysis”. However, it also notes a second contract (not mentioned by the No 10 spokesperson) , in 2010/11 involving the “provision of external training” and worth £40,000. I put this major discrepancy to Downing St who insisted that there were only ever three government contracts with the group and suggested I speak to the Ministry of Defence. The response is quite remarkable. The MOD is now contradicting previous information it has given out under Freedom of Information laws. That leaves two options. The first is that the initial information was incorrect and someone imagined a deal with SLC group for external training in 2010/11. The second is that the MOD and Downing St are providing false information to journalists regarding their dealings with SCL Group. This possibility would open a pandora’s box of questions over what the government is seeking to hide and why? It was revealed yesterday that Mark Turnbull of SCL Group and CA advised the Foreign Office on lessons from Donald Trump’s election campaign. The title of his lecture was listed as “examining the application of data in the recent US Presidential election”. That raises questions over whether the British government was already aware of the mass harvesting of Facebook data which sparked this scandal. Details are emerging about the worldwide activities of SCL Group and CA, touching almost every corner of the globe stretching from Brazil, to Nigeria, to Mexico and to India. But it has now emerged that in at least some of these these projects, CA coordinated with the UK MOD. In Ukraine, SCL were hired to implement a data driven strategy designed to “erode and weaken” anti-government opposition in the country and “win back control of Donetsk”. On their website the CA says it produced a project report to the President of Ukraine and intriguingly also “shared with the UK MOD”. It begs the questions, why is a private contractor involved in shadowy psyops working hand in glove with the UK MOD on foreign projects? With a spotlight on the organisation, the group seems to be quickly trying to batten down the hatches. The website for the Behaviour Dynamic Institute (BDI), the behavioural research arm of SCL group has mysteriously gone down. Remarkably (although perhaps less so regarding how close SCL is to the British establishment) the institute is based at the home of British science and research, the Royal Institute. According to a paper by the SCL director of defence Dr Steve Tatham, this makes it “almost unique in the international contractor community”. Quite. Tatham is another interesting case. He was former head of psyops for British forces in Afghanistan as well as Special Information Operations project officer in the UK Ministry of Defence Operations Directorate. Tatham went on to set up the training arm of SCL Group called IOTA-Global alongside SCL founder Nigel Oakes and delivered a $1m NATO training course in Latvia aimed at “countering Russian propaganda”. I contacted Tatham to ask if he would continue working with SCL group in light of the revelations, and he responded by saying “I suspect your question is academic as I can’t see SCL surviving this”. In further messages, Tatham distanced himself from Cambridge Analytica, the offshoot from SCL Group, and insisted his activities were “ethical” and “truthful”. “I have worked with SCL Defence on defence projects which is well documented, for example the NATO counter propaganda course in Latvia in 2015,” Tatham told me. “A point about what and who we train. Only NATO and friendly governments. And we only train truthful and attributable techniques. Why? Because our clients work with NATO and that is UK and NATO doctrine… as ex UK military senior officer I have strong personal ethics and that is why we are all so appalled at the revelations about CA”. With founder Alexander Nix being suspended from Cambridge Analytica, a pattern seems to be developing that shifts all blame for the recent scandals onto the subsidiary as opposed to the parent company SCL Group. However, with the links between the two organisations evident and further revelations emerging every day, it seems clear that this will not wash.
Was it aware of the data harvesting used in the US election? What is the phantom contract with the MOD in 2010/11 and what did the ‘external training’ involve? What did the other contracts that the government had with SCL Group involve and did it make any other payments to the group, outside of the contracts? Was there coordination between SCL Group and the MOD in other countries as existed in Ukraine? Why is taking so long for the Information Commissioner to get a warrant to search databases and servers of Cambridge Analytica? Until these are answered, we can expect this scandal, which reaches the heart of unaccountable British power, to rumble on and on. In regard to the last question posed by Bella Caledonia: "why is it taking so long for the Information Commissioner to get a warrant to search the database servers of Cambridge Analytica", allow me to answer truthfully: CA need more time to shred files and do a thorough in bleaching the hard drives beyond retrieval. Theresa May attends church near her Maidenhead constituency on Sunday.Photograph: Steve Parsons/PAThe Cambridge Analytica scandal engulfing the official Brexit campaign reached No 10 on Sunday, as campaigners wrote to Theresa May demanding an investigation into what members of her cabinet and her own staff knew. The letter from the anti-Brexit group Best for Britain came after a whistleblower told the Observer that Vote Leave channelled money through another campaign to a firm linked to the controversial data company Cambridge Analytica in a potential breach of electoral law. The allegations immediately put pressure on the foreign and environment secretaries, Boris Johnson and Michael Gove, who were leading members of Vote Leave. May came under pressure herself over the weekend after Downing Street was accused of outing the whistleblower, Shahmir Sanni, as gay in an official statement released on Friday. It was put out in response to allegations Sanni made about the involvement of one of May’s aides, Stephen Parkinson – a former senior Vote Leave official – in wrongdoing at the campaign group. Sanni said his family in Pakistan, where homosexuality is criminalised, are now in potential danger. Sanni had raised questions with the Observer about the validity of a £625,000 donation from Vote Leave to an ostensibly independent campaign group called BeLeave was channelled to the digital services firm, AggregateIQ (AIQ), which has links to Cambridge Analytica. What did Michael Gove and Boris Johnson know about the coordination of the Leave campaign and AIQ? Is the prime minister planning to investigate what they knew about the claims? Will the pair be recused from the Brexit “war cabinet” while these claims are being investigated? Does the prime minister plan to investigate the staff mentioned in the reports who work for No 10? Did No 10 directly out Sanni, or have any involvement in his outing? Were government emails, phones or equipment used? The letter came after the latest in a string of revelations emerged about the work of the leave campaigns and the data firm Cambridge Analytica. The £625,000 donation was, Sanni alleged, in breach of electoral rules because Vote Leave shared offices with BeLeave and exerted a measure of control over the smaller organisation. The rules require campaign groups that coordinate with each other to have a shared spending limit. Vote Leave has denied any such coordination. Sanni also alleged that, after the Electoral Commission opened an investigation, senior Vote Leave figures began deleting traces of their presence in files shared by the two groups. The official Brexit campaign’s director, Dominic Cummings, described that claim as “factually wrong and libellous”. Vote Leave said staff acted “ethically, responsibly and legally in deleting any data”. The Brexit whistleblower: 'Not cheating is the core of what it means to be British' – videoThe claims were quickly dismissed by senior Vote Leave figures. On Saturday evening, within hours of the news breaking, Johnson labelled the allegations “utterly ludicrous”, saying Vote Leave won the 2016 referendum “fair and square – and legally”. The environment secretary, who served as the campaign’s co-chair, chose not to address the claims of maladministration, but to recast them as an attack on the electorate’s decision. “I respect the motives and understand the feelings of those who voted to remain in the EU. But 17.4 million opted to leave in a free and fair vote and the result must be respected. It’s our job now to work to overcome division,” Gove said. The claims were also dismissed by Parkinson, in a personal statement released by No 10. In it, he called Sanni’s allegations “factually incorrect and misleading”. Downing Street refused to say on Sunday whether May continued to have full confidence in Parkinson. A No 10 source said the question would have to wait until Monday. Parkinson is one of a number of key figures likely to be considered by the commission’s investigation who now hold senior posts in May’s government. He could also face pressure to step aside voluntarily while the investigation is carried out. On Sunday, Labour’s deputy leader, Tom Watson, told BBC One’s The Andrew Marr Show: “Theresa May needs to make sure the Electoral Commission has the resources to fully investigate the allegations made that there was criminal collusion. CA was also involved in a recent Nigerian election.....what else were they involved in? Are they some deep state entity to leverage elections as their deep state masters desire? What is needed is a professional statistician or professional pollster to post some scientific information about the potential for such a "hacking" program to actually influence an election. The question should be asked "how many votes can be swung by these hacking activities by comparison by percentage to the votes being swung by people like George Soros and/or the Koch Brothers.?" Bad actors like CNN etc are spreading the idea that some very small amount of advertising is all that important in the election outcome. Cambridge spent $6 Million. But the total spent was at least a $Billion start to finish. If an election comes down to a 10,000 vote margin, then it's basically a crap-shoot anyway. You can look for any number of micro-details. Maybe somebody is paying the Weather Channel to falsely predict the weather on election day. Maybe somebody is paying a reporter to delay some news reports or paying newspapers to add an extra story the day before the election, etc. etc. It just doesn't make any sense to me to blame micro-influences for swinging the election. After all, the Prime Minister of Israel and the Pope both came over and addressed the Congress a couple of weeks before the election. The former certified that "Trump is not an anti-Semite". That's an endorsement and much more significant than this made-up stuff. If this is ok, then this type of open influence by Israel and the Pope dwarfs whatever made-up trivial "pop ups" or "bots" that may have been out there. And it is also dwarfed by what was done by Comey and the FBI. Even if the Pope did not endorse a candidate, then you could point to the difference in turnout brought about by the Pope's appearance. That's an influence, too. You can go around and around and around about all this "junk." And besides, nobody is saying precisely what happened regarding the hacking. It's all just blowing smoke as far as I can determine. It's a convenient excuse to get the politicians off the hook from having to discuss real issues and problems. Why enable them?